Boston’s South End is a great place to live. It has emerged as one of Boston’s most popular neighborhoods, making South End Boston homes for sale are highly desired. It’s easy to see why. The South End is vibrant and picturesque with tree-lined streets, fine dining, art galleries, and friendly faces. South End Boston real estate is located just minutes from downtown and the Back Bay. The South End has attracted a diverse blend of young professionals and families. The neighborhood contains some of Boston’s finest restaurants. There are also nearly 30 parks here. The trendy South End is also full of brick and brownstone townhouses, brick sidewalks, and community gardens. The neighborhood has even been listed on the National Register of Historic Places and is a Boston Landmark District. The shopping options are endless here. South End Boston homes for sale are nearby boutique clothing stores, eclectic home and gift stores, and delectable bakeries. In the spring and summer months, residents can explore the SoWa Open Market to find hand-made art, antique treasures, and baked goods. There’s also an array of diverse dining options, including Restaurant Row found on Tremont Street as well as great restaurants on Harrison & Columbus Avenues. 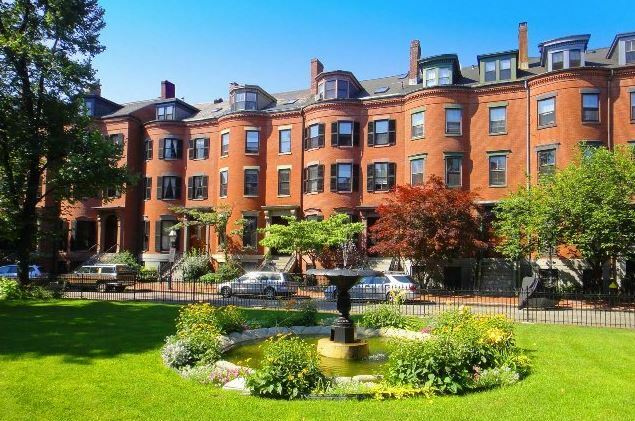 South End Boston homes for sale are perfect for students, professors, or professionals since the Boston Center for the Arts, Boston University Medical Campus, and the Boston Ballet can all be found here. Boston’s South End is all about diversity. The architecture of the homes consists of a wonderful mix of old and new architecture. There’s classic brownstones as well as ultra-modern loft-style residences. There’s also the renowned Victorian brownstone buildings and homes ranging in size from the smaller buildings found on Appleton St, Gray St. Lawrence St., to the grandest scale buildings along Tremont Street, Columbus Avenue and Massachusetts Avenue. The diversity of homes for sale in the South End easily caters to any homebuyer’s personal tastes. Whether you are a young professional, an empty-nester, or a family looking to live in the city, the South End is the place to live. Home price ranges from the low $400,000’s to $4 million. Home type ranges from studio units to floor throughs, duplexes, triplexes, and entire townhouses. With South End Boston real estate, you’ll find a variety of floor plans to suit your needs. Discover all the features and comforts that South End Boston homes for sale have to offer. You’ll love settling into this hip, lively neighborhood. If you’re interested in South End Boston real estate, please contact Ken Snyder at 857-264-1276 or by email at ken@kensnyderhomes.com. Here is an opportunity to own a spacious two bedroom condo in a grand South End Brownstone while making it your own. Ready for your updates, this home features all the details including original moldings, marble mantle, hardwood flooring, high ceilings and a private deck. The floor plan leaves no space wasted and includes an impressive living area with sunny bow-front windows,10 8217; ceilings and crown molding. Adjacent galley kitchen features dishwasher/disposal and granite counters. Two rear bedrooms with skyline views, include a larger master and guest room with access to the private deck. Laundry in-unit. This home lives large on one of the best South End blocks. Just moments to the Back Bay, Orange Line T and all the best restaurants in town. Located adjacent to Franklin Square and hot restaurants like Toro and Stella, this condo offering affords buyers access to one of Boston's most sought after neighborhoods. The spacious kitchen offers white shaker cabinets, stainless appliances, gas cooking and an 18 dishwasher! The subway tile backsplash ties the design together with an under-mounted sink basin and brushed nickel hardware. The bathroom has a painted tile floor, rain shower head and stylish subway tile surround. Just move right in. There is private storage in the building along with several washer / dryer's. This is a unique opportunity to invest in a neighborhood that is about to see 1,600,000 square feet of office and retail space added to it at 'The Exchange'. Also located close to Boston University Med and BMC, these homes offer opportunities for those in the medical field as well. On Bond Street in the lovely residential neighborhood of the South End, this understatedly modern single family residence is situated. Having the rarity of deeded garage parking just around the corner, this beautifully renovated home offers a large floor-plan of over 3300 square feet of living space, with 4 bedrooms and 3 full baths & two powder rooms. It also features a soon to be built deck with stunning city views. The private full-floor master suite has an office area, nursery and large custom built walk in closet as well as a luxurious master bathroom with a spa shower and soaking tub, double sink and vanity. A gas fireplace adds to the gracious atmosphere for comfortable living. There are lovely formal rooms, a large chef 8217;s kitchen with breakfast alcove and Subzero and Wolf gas stove. The inviting family room has a wet bar and refrigerator. This magnificent residence is not to be missed! Now is your chance to own a piece of one of Boston's most sought after developments. This immaculate 1 bedroom condo at Siena's Ink Block features state of the art kitchen appliances, a private balcony, and is located on the rarely available and most desired side of the building, allowing for jaw dropping city views. Siena features area amenities such as Whole Foods Market, Bar Mezzana, Fuji Sushi, Lions Tail, Sweetgreens, Core Power Yoga, Turnstyle Cycle, and much more, crowning the area as one of the most thriving and vivacious locations in Boston. Come see this rarely offered condo before it is gone! Spacious 1 Bed Loft in the desirable Gateway Terrace Condominiums. The gourmet kitchen has gas cooking, Bosch appliances, a large granite breakfast bar and plenty of cabinet space. Full garage parking space included (plus additional storage unit) accessed by elevator. Central A/C with multiple zones and in-unit laundry complete this wonderful home. The building features a beautiful common courtyard that is equipped with a gas grill and patio furniture. Fantastic SOWA location close to Whole Foods, and some of Boston 8217;s best dining / shopping. SIx Lawrence Street is a beautiful Victorian row house nestled on one of the loveliest and quietest streets in Boston 8217;s historic South End. Your home is located just blocks from Copley Place and Back Bay station. A formal receiving parlor where you enter the house allows you to gaze into the open two-story kitchen, living and dining area which features a wood-burning fireplace. A beautiful private garden opens from the living room creating the perfect flow for entertaining and children 8217;s play. Upstairs are four large bedrooms with gorgeous wide-plank, natural wood flooring, and an additional 2 full baths. Best of all, this home is walk-in ready at a price less than most condominiums of similar size, in a location that can 8217;t be beat. Located on a coveted block in the South End 8217;s Eight Streets neighborhood, this top-floor home is unique in many ways. The extra wide building allows for single level living, a rare feature for over 1600sqft. Only one easy flight of stairs takes you to the unit door, where a coat closet awaits. Unit 4 features hardwood floors, a gourmet kitchen with gas range, two full bathrooms, in-unit laundry, skylights, and a full staircase to the large private roof-deck. Very low condo fee too! The four-unit, pet-friendly association is all owner occupied.